Lean Thinking: Lean and the Airline Industry – Help Please! 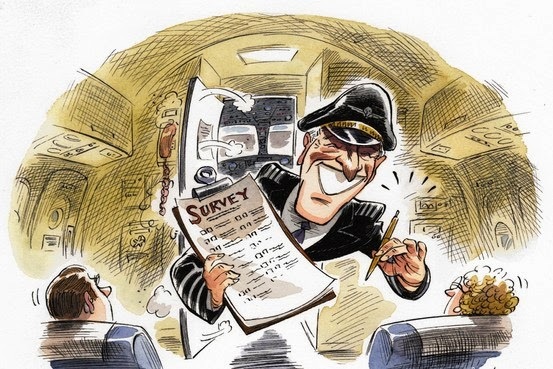 Lean and the Airline Industry – Help Please! A couple of incidents on a recent trip home from a client prompted me to write this blog. The trip involved a connection and two different airlines were involved. As such, I won’t single out any specific airline as I believe the problem is endemic to the entire industry. In both flight segments, the aircraft arrived at the destination on time and so would score well in their on-time arrival metric. However, in both cases, problems occurred after the aircraft had come to a stop at the gate which delayed my on-time leaving from the gate area. So much for their metrics. In the first case, my carry-on luggage had been gate checked which meant that I could pick up my luggage in the gateway after leaving the airplane. Normally this takes a couple of minutes however this time I waited over 15 minutes for someone to deliver the bags. Cause – no baggage handlers. In the second leg of the trip home, again the aircraft arrived at the gate on time but this time passengers had to wait in the aircraft for 15 minutes until we could deplane. Cause – no gate agent. As I think back on both situations, it was as if someone had called out “Surprise – an airplane showed up”. In the case of the airline industry, they provide a service and can’t store that service so inventory isn’t applicable. Now we’re left with two options, however, the airline industry is fixated at running aircraft at maximum utilization and driving minimum cost so there is no spare capacity in either equipment or people. That leaves leadtime as the only way to buffer variation which means passengers getting delayed anytime there is a disruption somewhere in the system. Delayed arriving on time, delayed getting our luggage, delayed getting off the aircraft. I once contacted the call center for another airline only to be told by a recording there was a 45 minute wait to speak to an agent. I think it’s time for a new business model in the airline industry – one the starts with Customer Value and provides a different value proposition. Whether you are a frequent traveller or not, I’m sure you agree. If any of you have any stories about air travel, good or bad, I’d love to hear about them.